There is a professional publication that arrives every month in my mailbox – Healthcare Business Monthly. It comes as part of a professional membership I have in the healthcare industry. I appreciate all the work that goes into this publication but many times the articles are fairly dry and technical; however an article by Tara Cole in the June 2016 issue (page 58), really caught my attention. The title of the article is “Advance to the Career You Want”. In this article the author provides tips on how to develop yourself professionally and move into the career you want. I thought the author’s tips in this article could translate into how to “Advance to Where You Want to Go with Your Art”, “Artist Development”, “Advance Your Creative Journey” or something like that. And now here is a random photo: Recently I returned from a long weekend visiting a friend in the Denver, CO area (see post Creative Inspiration: Travel). During on weekend together, we went on lovely walks on nature trails. One of the trails had many gopher or prairie dog holes along the path and I was fascinated looking at the prairie dogs popping up and talking to one another. Sometimes on your creative journey you have to retreat into a metaphorical hole and focus alone on your art. Sometimes on your creative journey you have to venture into an unknown hole to move forward in your art. This morning I continue my ongoing series of posts on books I have borrowed from my local public library. I have already begun nesting with a pot of tea in my favorite chair with some of these books! I usually start with the lighter “picture” book first, and I have already finished Cabins: The New Style by James Grayson Trulove. It is a book of obviously very wealthy people living in very beautiful large cabin like homes, in very picturesque settings! The trouble with not accepting responsibility for ourselves is that we feel helpless, and that makes us grabby and greedy. It empowers the “more” mentality. We don’t realize our ability to be patient and trusting, so we push to the front and demand our share first, or demand more than our share. And the people we meet on this path are doing the same thing. We are all pushing and grabbing and trying to get there first, wherever ‘there’ might be. I think she is spot on about human behavior. After this book, I will move to something lighter like Materially Crafted: A DIY Primer for the Design-Obsessed by Victoria Hudgins. 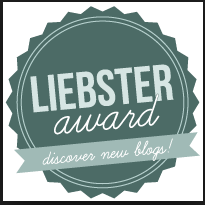 As you can see, I am playing with my blog template again. 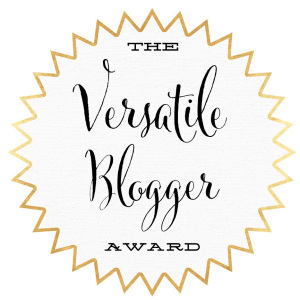 Why does WordPress give me so many interesting options for my blog template? How can I ever be happy just sticking with the same template, ha! I welcome your feedback on the latest look to the tierneycreates blog: “Chalkboard” template. The flowering crabapple tree is in full bloom in front of my house and unbelievably, deliciously, inspirationally fragrant. When I step out from front door I am immediately enveloped with this incredible scent of Spring and the sounds of busy bees buzzing around the crabapple tree blooms! I appreciate all the feedback on this post. I did decide to orientate the piece vertically. It is now with Betty Anne Guadalupe to work her quilt magic. I recently learned that my piece, made from discards from another quilter’s project, We Will Not Be Discarded, has sold in the Twigs Gallery Collaboration show! Very exciting – this is my first time selling my quilting art at a gallery show! If you would like to read more about the story behind this piece, please see the post What’s on the Design Wall: “We Will Not Be Discarded!”. I walked Pilot Butte again today, this time it took me 46 minutes to go up to the summit and back down, 4 minutes off my time last Monday (when I returned hiking our “mini mountain” in town for the first time after an 8 month hiatus after my foot injury). The 360 degree views of Bend, Oregon and Central, Oregon continue to be breathtaking on another impossibly blue sky day here (we have a lot of impossibly blue sky beautiful days). In the post You Got to Start Somewhere I shared that I listened to the audiobook Become Who You Were Born to Be by Brian Souza while hiking Pilot Butte. Today I continued my listen of this inspirational audiobook while hiking the Butte. I wanted to share a wonderful quote by Ralph Waldo Emerson from this book which brought a smile to my face and a small tear to my eye from its beauty and truth. I am sure before the end of the week I will have more thoughts to share with you from all the thoughts that constantly swirl around in my head. Perhaps they will even have to do with quilting! (Smile). Before I continue my series on sources of creative inspiration, let’s talk about winter trees a little more. I am still musing over the Winter Trees I discussed in yesterday’s blog post by the same name. Since I was a child, I have been in love with the public library. I remember a summer in my 10th or 11th year that I spent many days of my summer vacation at my small town’s public library. Books are magical. To have free access to all those magical books is even more magical. For a time in my life I wanted to become a librarian, so I could spend a career among the books. I did not pursue a career in library science as an adult, but I kept my intense love of public libraries and of books. I frequently patronize our local public library and I find their shelves filled with sources of creative inspiration. It would be very expense to buy all the books I would love to have in my personal library, and if you have read my post Craft Book Hoarder?!?!? it appears that I once tried to do that! Embracing the minimalist, “scale back your life”, “living with less” movement, I borrow from the library, books that inspire me creatively. If the book turns out to be a “must, must, must have” then I will purchase it, but rarely. I have e-mailed our public library’s material purchasing department and thanked them for the wonderful selection of crafting, gardening, and home decorating books. I think it is important to let them know a patron really appreciates their well curated collection! In future posts I will share an update on “craft book hoarding” (yes, I actually let go of a large amount of craft books); and discuss one of the recent crafting books I borrowed from the public library that I absolutely had to own (The Improv Handbook for Modern Quilters: A Guide to Creating, Quilting, and Living Courageously by Sherri L. Wood). This post is an update on the post What’s on the Design Wall: “We Will Not Be Discarded!”. I have been working on assembling the blocks designed from discards, from another quilter’s block piecing, and a solid coppery-rust fabric, into a piece called “We Will Not Be Discarded”. I am leaning towards Option #2 as it makes the piece appear to have more “movement”. Once I finish all 15 blocks, I will play again with the final arrangement. We Still Will Not Be Discarded! Trimmed discards from the “trimmed discards” in my little trash basket – tempting! I keep two journals. One journal for art quilting ideas and inspirations; and another journal for tierneycreates business, blogging and life in general ideas and inspirations. The journal on the left, used for art quilting ideas and inspiration, has a handmade cover that I made during an intuitive design piecing class homework assignment. The lime green “sketchbook” on the right is what I use for tierneycreates, blogging ideas and life inspiration. I got the idea of keep an art quilt ideas/inspiration journal from Jean Wells Keenan‘s brilliant books Intuitive Color and Design: Adventures in Art Quilting and Journey to Inspired Art Quilting. I was also fortunate enough to take her series of classes, Journey to Art Inspired Quilting, twice and see in person her wonderful inspirational art quilting journal. In my art quilting journal I keep clippings from magazines and photos from my travels and nature that are future inspirations for art quilts. At first I had planned to use my art quilting journal for blogging ideas and tierneycreates business ideas. I discovered I wanted to keep the art quilting journal for quilt ideas and development. So I started a second journal. I love both my journals, but I use the second journal (which I will refer to as the “tierneycreates journal”) more frequently. The “tierneycreates journal” is where I write down ideas I get from listening to home-based business related audiobooks; books from the library on small business development and growth; quotes I find in magazines, books or hear on the media (radio, TED Talks, television, etc. ); and any notes from searches on the internet (for example: What are the standard sizes for table runners that I should use for my tierneycreates Etsy shop table runners?). I also use the”tierneycreates journal” to map out my future blog posts or blog post ideas. Sometimes I will spontaneously write a blog post, and sometimes I will write a post about a topic I have been thinking about for a couple of weeks and already fleshed out in my journal what I want to write about that topic. I find it challenging to keep sudden ideas and inspiration stored in my mind. It seems that inspiration and ideas can come to you at any time. My journals provide a way to record them, even if they are only a skeleton of an idea that will need its internal organs and flesh added at a later date! As mentioned in my series of posts on Nonfiction Audiobooks, I continue to enjoy listening to audiobooks while I work on quilting projects. I recently finished a wonderful and inspirational audiobook by Anne Lamott – Small Victories: Spotting Improbable Moment of Grace (Riverhead Books, 2014). The audiobook was read by the author which is always a treat for me – you get to experience what the author feels should be emphasized in the reading of a book based on their vocal inflections. This book is basically a collection of personal biographical essays on the author’s experiences. Anne Lamott tells these stories with raw, relatable, and passionate language from a deeply spiritual yet deeply irreverent perspective! So far one of my favorite nonfiction audiobooks of all time. This is technically Part II of yesterday’s post “Inside the Studio“. A friend suggested I share what is inside the closet in my studio. Here are photos of the left and right side of the closet, which has sliding doors so I cannot fully open the closet to expose both sides at once. I like to think I am organized. I know I am more organized than I used to be and I can find things fairly quickly. I bought a label maker a couple of years ago and have fully embraced its use! No not that exciting – just recent photos of my studio where I do my tierney-creating! The back wall where I keep my fabric scraps by color, and my cutting table where I hide underneath those things that-are-not-finished (that brightly colored batik quilt it meant to distract the viewer from what is beneath…). To the lower right of the photo you will see my mini design wall. I learned from a quilting friend that it is handy to have a smaller portable design wall. My sewing machine and ironing board (two very essential items!) I got the idea from another quilter to cover my ironing board with a towel to make ironing smoother and easier. Sometimes I also use a cotton dishtowel to iron small pieces on. My wonderful brother gave me the sewing table for my birthday last year and the leaf folds down and the table becomes a small cabinet if I need more room). My IKEA Billy Bookcase of fabric! This organization came out of my massive fabric purge in 2015 (see post The Fabric Purge!). The curtains in the room are made from a sari my friend Jenny brought back from her trip to India for me. My storage closet with custom made sliding doors which I first discussed in the post Rethinking a Closet. One door has sheet metal mounted to serve as a magnetic idea board. The other has batting attached to serve as a design wall (refer to all my posts on “What’s on the Design Wall). I am not sure why I selected the color yellow when I painted this room 8 or so years ago. Somedays I think: “I am going to paint it white or some other neutral color”. Yellow can be overstimulating, but I simply embrace the over stimulation and decorate the room with brightly colored things – like this lovely quilt my friend Judy made me and several silk screen prints from an artist friend in my youth (the other silk screen is in the first photo). I like to watch “quilting movies” (movies you don’t really have to pay close attention to) and documentaries while I am quilting on the screen below. Another brightly colored piece of art in my studio – a wallhanging from my friend Betty Anne. Well back to creating in the tierneycreates Studio – I better not keep that Design Wall empty for too long! We shall not cease from exploration, and the end of all our exploring will be to arrive where we where we started and know the place for the first time. 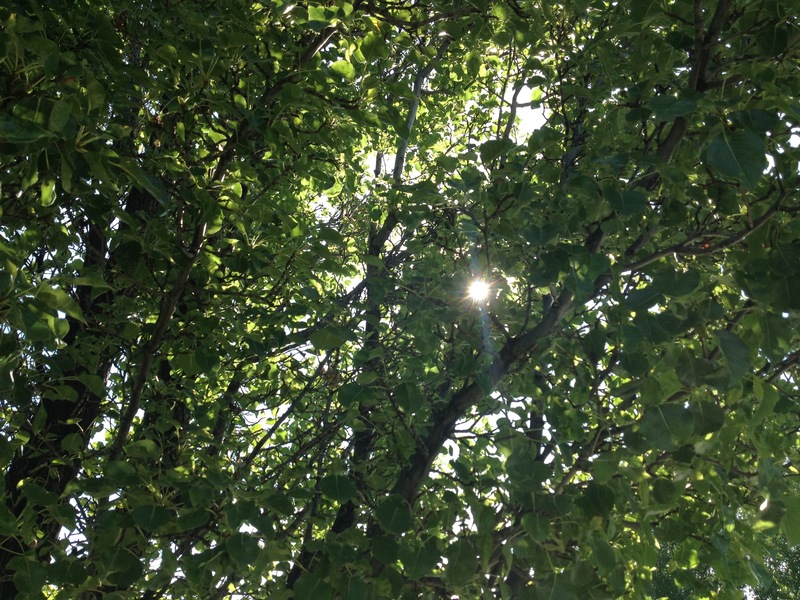 This post continues my series of posts on Sources of Creative Inspiration. I was wandering a thrift shop today with some friends, and came across the first official quilting book I ever owned: Diana McClun and Laura Nownes’ book Quilts! Quilts!! Quilts!!! 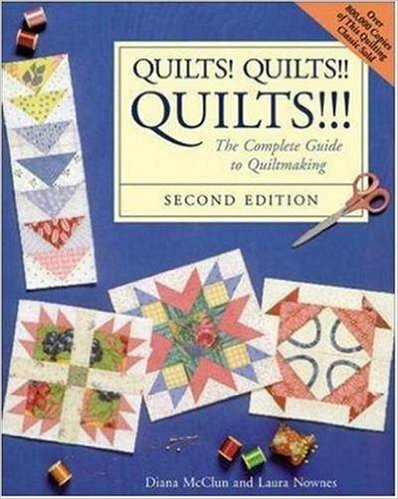 The Complete Guide to Quiltmaking (1998). I bought this book in the late 1990s, I still have this book in my personal collection, but I have not looked at it for years. Seeing the book Quilts! Quilts!! Quilts!!! The Complete Guide to Quiltmaking (1998) suddenly creatively inspired me! IDEA: I am going to do a series of small quilts made from recycled clothing based on patterns from this book. Invite Creativity In by Kicking Clutter Out! I have been working for a while on downsizing my stuff and reducing clutter in my life (see recent post The Space in Which We Live). As part of this process I have been working through my craft magazine collection (as a prequel to some day conquering my craft book collection – see post Craft Book Hoarder?!?!?!). Since 2008 I have been reading and collecting Interweaves’s Cloth-Paper-Scissors Studios magazine (who’s tagline is “inspiration & ideas for your art and craft space). In order to let go a a magazine, I feel like I have to read it again or at least skim it and see if there is anything interesting in the issue that I want to reference or stick in the back of my mind. 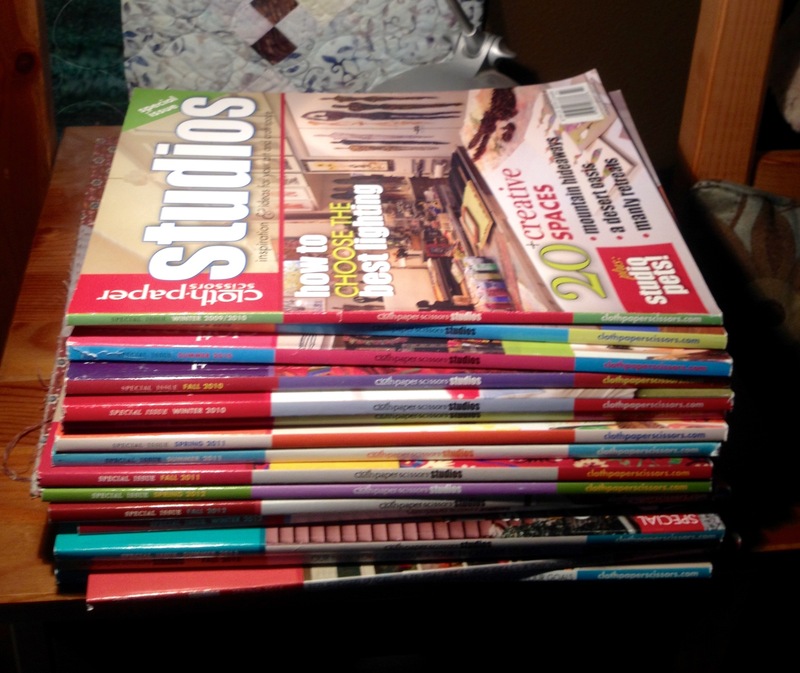 So I stacked all my old issues of Cloth-Paper-Scissors Studios magazine and started going through them. I came across this great article in the Spring/Summer 2009 issue by Lesley Riley: “Clutter Out Creativity In: 10 Steps to a More Artful Studio”, and I wanted to share a listing of her steps to deal with studio clutter. I think they are fairly self-explanatory but I have added a couple comments based on the article or my own experience. After I finishing letting go of my already read (twice) Cloth-Paper-Scissors Studios magazine, I can’t promise I will never buy an issue again. This is truly a wonderful magazine with glimpses into artists’ studios and their inspiration. As John Donne said: “No man (or woman) is an island”. I guess one could live as a hermit somewhere, locked away, working on your art, encouraging yourself creatively. That would not work for me. 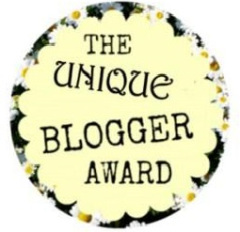 I appreciate and I am inspired by encouragement from others. Continuing my series on sources of Creative Inspiration, this post is actual inspired by a surprise I found that last evening. We all have those precious items from our past that we keep tucked away somewhere. One of my most precious items was a book of William Shakespeare’s Sonnets from my 9th Grade English teacher. I have not seen it in many years and I thought that for some reason during a move it got lost; or I accidentally donated it to a thrift shop in a stack of books for donation. Last night I was checking the far recesses of my nightstand cabinet, which I store books I am going to “read someday in bed each night before I fall asleep”, but never get around to reading. I was curious what I had way in the back and found my old beloved book!!! I had not opened it in 8 or more years and forgot exactly my teacher had inscribed inside the cover. Just reading these words again from my 9th grade English teacher made me feel as inspired in that moment as I did all those years ago. 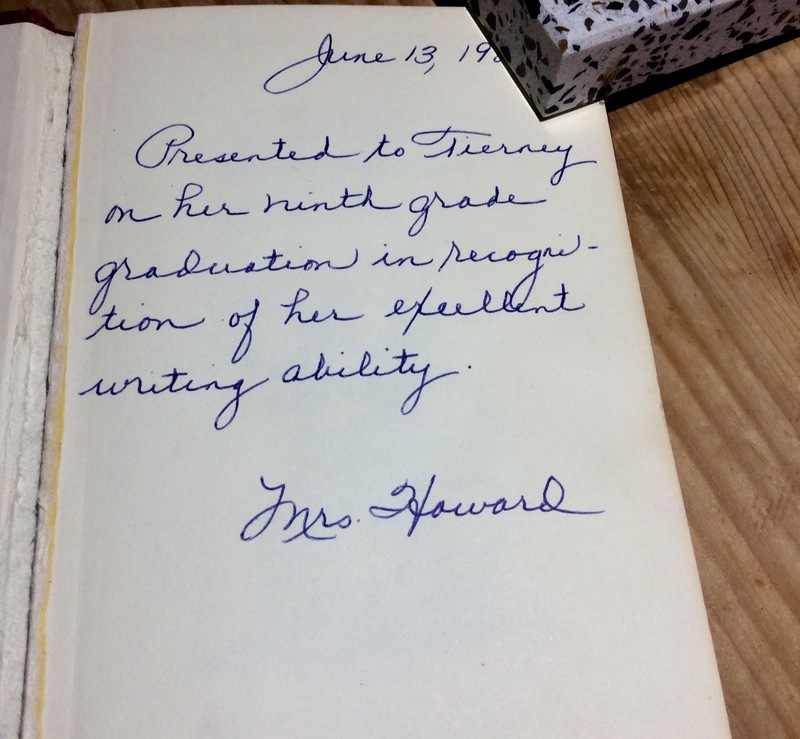 Her words of encouragement from the past resonate with me now, like she is right here with me saying: “Tierney, keep writing, I believe in you“. As far as quilting projects, I am so inspired creatively when I receive encouragement on a piece I am working on or one I have completed. I am encouraged creatively when I am uninspired to work on an art quilt and a friend encourages me to just start playing with the fabric and the inspiration with come in no time. 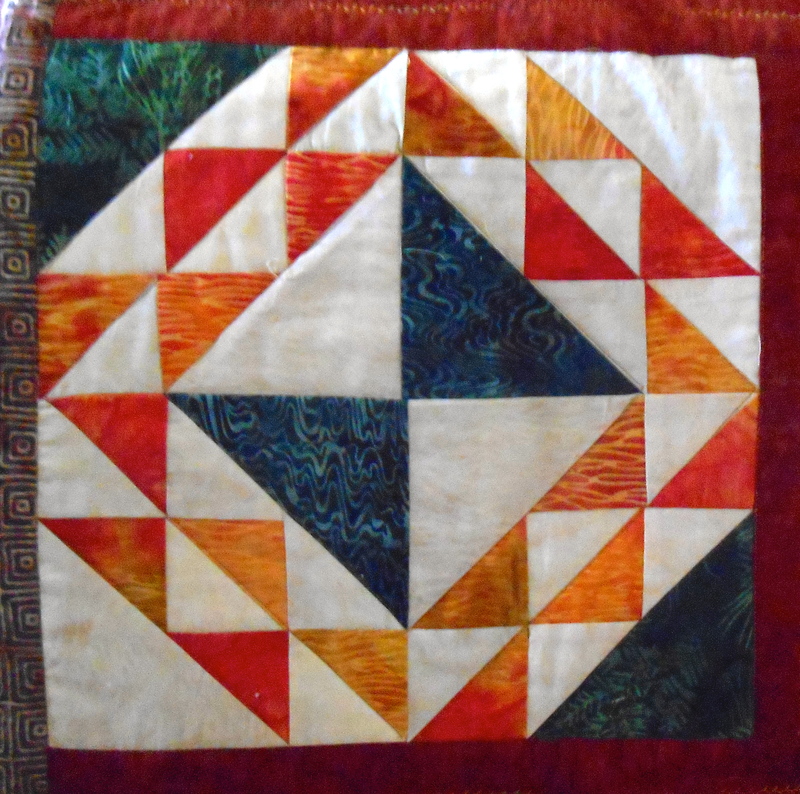 One of my favorite silk art quilts I have made, Color Change, came out of sitting around with a friend having her throw fabric scraps at me for fun, saying “Here, why not try putting this combination together”, when I was feeling too intimidated to work on another silk scrap quilt. Creative mentors who encourage you to do your art are important and wonderful to have in your life. 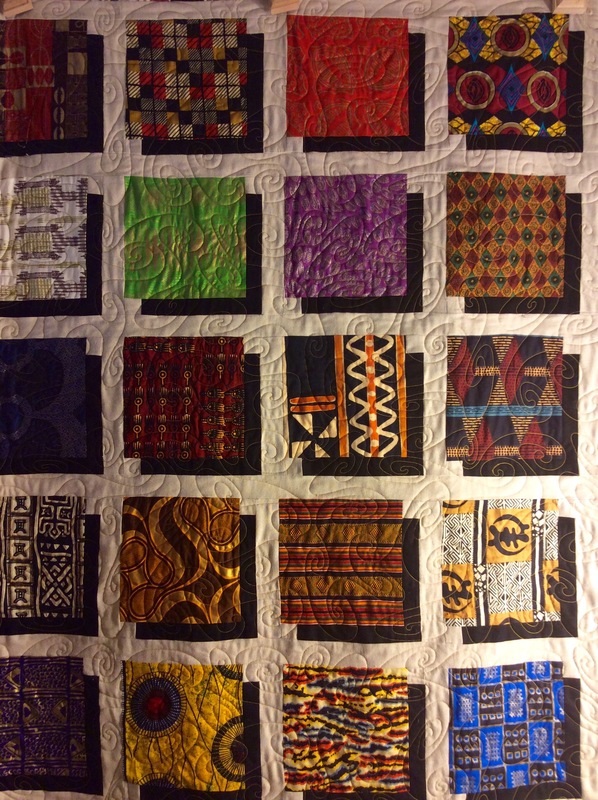 See my old post Creative Inspiration: Quilting Mentors, for more on mentors. So let’s all go out and encourage someone, you never know what lasting impression it will make. Time to continue my series on my sources of creative inspiration. In my last post on creative inspiration, Creative Inspiration: Organization?!?! ?, I explored how getting organized makes me feel inspired creatively. Recently I have been thinking about how written or spoken words inspire me creatively. Not just any words. The “words” that inspire me are motivational words, inspirational sayings, words of truth, insights into the human struggle, words with meaning – words that matter. In previous posts I discussed some of my favorite nonfiction audiobooks (see my series “Life is Nonfiction”) that I enjoy listening to while walking or working on a quilt. Most of these books are in the “self-help” or “self-improvement” genre and they inspire me to be bold and take chances creatively with my art or with my tierneycreates business. I continue to be addicted to self-improvement books and they inspire my creativity. When a book encourages me to be brave and take risks, I translate this into my work on art quilts or new ideas for tierneycreates. These books reinforce what I already know deep in my spirit but somehow do not implement in day to day life. All these quotes I have posted in my house somewhere: in a frame, on a bulletin board, or in a piece of wall art. I feel like the words in these quotes are part of me. They make me feel safe to do my art and to go where I want to go creatively. One of the quotes is by Rumi. Jalāl ad-Dīn Muhammad Rūmī was a 13th century Persian poet and scholar. I am currently listening to an audiobook, Pure Water – Poetry of Rumi and I want to close this post about inspirational words with one of Rumi’s poems, The Guest House. Are you familiar with the Tao Te Ching? This ancient Chinese text, was according to legend, was written by Lao Tzu in the 6th century BC. It it a philosophical text which provides instructions on the way to live a virtuous life of harmony. There have been many versions of this text written and reinterpreted over the years to include The Tao of Pooh by Benjamin Hoff which share practical life lessons from the perspective of Winnie the Pooh.